Hughes with a nice wrister but LaFontaine with a better save. Lots of pressure here from UW. 22-14 in shots UW. Crowd is still not pleased, btw. 3:47 left in the second, UW leads Michigan 2-1. Long shot held by Berry ends a string of 9 straight shots on goal for UW. TV timeout with 3:47 remaining in the second and the Badgers lead 2-1. UW up in shots by a count of 22-14. UW's Hurley made a nice play to break up a Michigan 2-on-1, going down and swatting the puck off Shuart's stick. This period has been all UW. Also I have no idea what's going on with the lines. They appear to change every shift. Berry keeps the right pad down at the post to deny Sanchez in close. Pastujov had a breakaway but didn't get much on the shot. And Berry stops Pastujov with the right pad on a breakaway in the final minute of the second. END 2: Wisconsin leads Michigan 2-1. Wolverines string together some good shifts at the end of the period after UW regains the lead. Michigan with a few big opportunities to end the second period -- looking forward to an exciting third in Madison. UW and Michigan headed out on the ice for the final period of regulation. 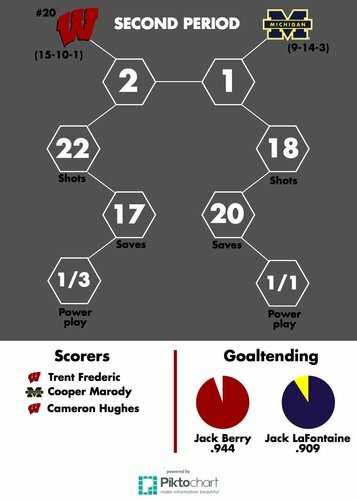 Badgers lead 2-1 and have a 22-18 advantage in shots on goal. Third period is underway with Wisconsin leading Michigan 2-1. Shots are 22-18 for UW. Third period underway. 2-1 Badgers. UW needs all three points to keep pace with Minnesota. Cullen Hurley is called for interference and the Badgers will be on the PK for the second time tonight. Michigan gets pressure after Hurley's stick snaps on a clearing attempt. Hurley called for interference, playing with broken stick. 17:56 3rd | U-M heads back on the PP! Wisconsin's Hurley is called for interference - playing with a broken stick. Kunin denied on a shorthanded breakaway. And then Berry makes a strong save at the other end. 2-1 UW, 16:18 left. Kunin steals the puck from De Jong at the blue line and goes in on a breakaway but LaFontaine stops him. Badgers kill it off! Hurley steps out of the box and we are back to even strength. UW leads with 15:56 left in the third. Malone with a slick move to get the net but couldn't beat LaFontaine. 14:35 left in the third, UW leads Michigan 2-1. 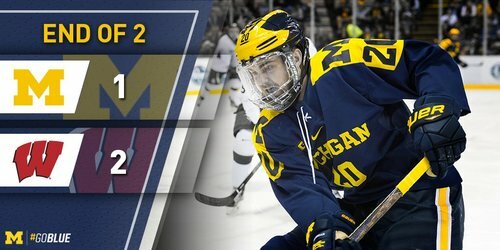 Michigan's Shuart has 2 good looks in front of the net but both go wide. Max Shuart just had two golden chances but just couldn't find twine. Long spells of possession for Michigan but Berry and the defense are able to stand tall. Under 13 left in the game. 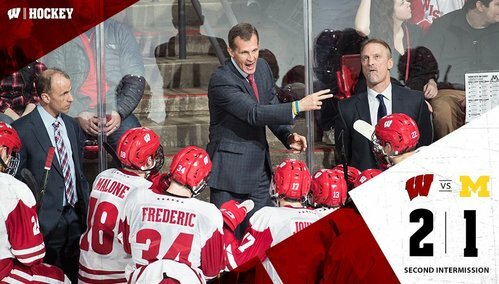 Cameron Hughes' ability to win face-offs continues to be huge for Badgers. 2-1 UW. 28-22 in shots Wisconsin. 11:42 remains. Badgers send out Ustaski, Frederic and Cavallini for a defensive-zone faceoff and they take it to the other end of the ice. Big deflection from Sam Piazza to stop a chance in the center of the ice from Davison. 11:42 3rd | Michigan putting on a lot of pressure and creating scoring chances in the Badgers end of the ice. Atrocious D Zone breakdown for UW and this game is tied. Michigan ties it up after a Badger turnover. 2-2 with 11:12 to go in regulation. WOLVERINES GOAL: Bad giveaway by Davison turns into an Evan Allen goal after Winborg picks it off. 2-2 with 11:12 left in the third. Evan Allen scores on a pass from Adam Winborg. Easy put in from point-blank range after a turnover. Davison passed it right to Winborg in the defensive zone. Evan Allen ties it a two apiece with his third of the season! Frederic gives UW the lead on a tip-in after a fantastic pass from Kunin. BADGERS GOAL: Trent Frederic gets his second of the game, tipping in a Kunin pass for a 3-2 UW lead with 9:37 left. Frederic got position right in front, Kunin sent it across ice and Frederic tipped it in.